When you flip the CD from the jewel-case it reveals the wrinkled white contours of a human brain. Is this some kind of metaphor? Not quite. There’s an Ian North who once fronted Milk & Cookies, he has a retrospective album called My Girlfriend’s Dead also out now. This is not that Ian North. 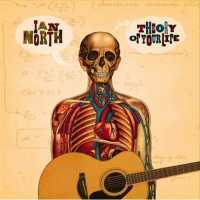 This Ian North is the alt-country Toronto troubadour who had a 2002 album called Emptiful, literate with playful offbeat allusions to music history and pop culture in general. Now with his own punningly-titled label he presents eleven more original Beat-poetry turned songs detailing restless movement, heaters that don’t work, bank robberies in Vancouver, skater girls, drifters on the road, and fistfights in a Buffalo trailer park. Only occasionally confessional, these are more often narrative lives that unfold like fiction, but stronger because of it. Mighty Fall is a rolling tumbling verbal-cascade of a song located someplace around Subterranean Homesick Blues – but not quite, revealing an impressive dexterity with such stuff as onomatopoeia and internal rhyme that’s also great fun (“an accordion of boredom… with a marigold manual” indeed!). The track leads in with a hesitant stop-start riff that sounds like an outtake, until it cleverly and unobtrusively builds into the song’s mid-tempo spine. There’s nothing as obvious as hooks or choruses, instead verses slip and slide, dive and fall. The sparse small-group richness of Ian’s clear strong voice falling just the right side of expressive, with colour shaded in by Alexander Andrew’s lap-steel (on The Ballad Of Stephen Reed), Michael Johnston’s piano (on Meticulous) or Jennifer Claveau’s understated vocal harmonies. Then Tin Pan Alley carries lost echoes of Phil Ochs beautifully desolate William Butler Yeats Visits Lincoln Park And Escapes Unscathed, in the melancholy beauty of the secret key to heaven lost in a song that grows ever-fainter on the radio. The cover shows a skinned human body, the kind of naked inner organs, muscles and veins that caused such ripples of unease in Professor Gunter van Hagen’s high-profile ‘body works’ art displays of ‘plastinated’ corpses. This might be another metaphor for stripped-back rawness. But probably isn’t.